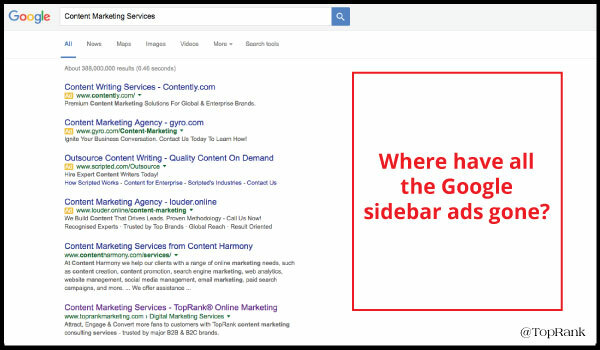 You are here: Home / New @TopRank / Google Ad Changes: More Top Ads! No Side Ads. More Bottom Ads? Google Ad Changes: More Top Ads! No Side Ads. More Bottom Ads? There’s been a lot of talk about what’s happening with ads on Google. We’ll keep it straight to the point by telling you what happened and how this change may affect ad and organic click-through rates. There are now 4 ads on top instead of 3 for commercial queries that surfaced 3 ads on top in the past. How Will This Affect Search Ad Click-Through Rates? Overall, it’s important to keep in mind that ads on the right rail typically see nominal levels of activity. According to Larry Kim at Wordstream, ads appearing on the right-hand side receive less than 14.6% of paid clicks. Ultimately, from a performance standpoint, the impact isn’t going to be earth shattering for most paid ads. How Will This Affect Organic Click-Through Rates? Now we have less ads altogether, but more ads dominate the space that users use the most: the top of the SERP. Some may predict that this will decrease organic click-through rate by pushing organic results below the fold. I would disagree. If anything this may reduce the click-through rate of the #1 ranking organic result and distribute that click-through across results 1-3. Why? Because when people only see ads and not a single organic result, they will scroll – and not just a little bit. Ever heard of ad fatigue? My prediction is that users will scroll down to get an idea of what the organic results are and that this will become a habit. So when users perform a commercial search, the habitual action for many users will be to scroll to see the organic results, making more organic results visible right away and leaving just one or two ads visible (notice that if this happens, the lower ads that appear at the top will be the ones to remain visible after the scroll). In the past, being above the fold in organic results has been a huge advantage for CTR. Now that we find ourselves on a playing field that’s a bit more level, with more organic results (including #1) appearing below the fold, is it reasonable to say CTR will be more evenly distributed across top ranking results? Only time will tell.